Roll goat cheese into balls approximately 1/2 inch in diameter and put onto a cookie sheet lined with wax paper. Place in freezer for 30 minutes or until goat cheese balls or become firm. Cut each rosemary sprig into 3 equal size sticks, approximately 3 inches long. Remove the leaves from bottom 2/3s of each stick. Drain tomatoes of oil. Pinch the sides of each tomato around a goat cheese ball (like a tomato taco filled with the goat cheese) and skewer them closed with a rosemary sprig. 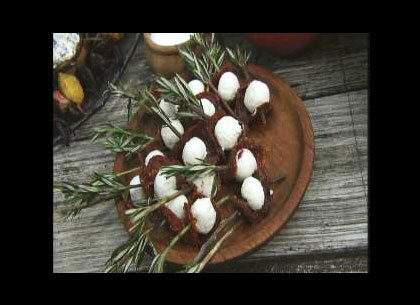 You may need to use a metal skewer to poke holes in the sun-dried tomatoes before using the rosemary sprig. Repeat until all of the skewers have been used up. Place on a platter and keep refrigerated until ready to serve. Chef Michel Nischan notes: You can also "air-dry" your own tomatoes by slicing and slow roasting for 6 to 8 hours in an oven on a very low temperature (150° F or below). This segment appears in show #3210.